Compact deskside shredder. Separate cutting unit and collecting bin for CD and DVD. Easy to empty bin. On casters for flexible use. Removable catchbasket. Material: shock resistant plastic, recyclable. Quiet as a whisper @ 55dB. Up to 8 Sheet Capacity. 2 x 8 mm / DIN 66399 Security level P-5. Shreds CD's & Credit Cards to a separate cutting bin - to enable easy recycling. 2 Year machine warranty. 10 year cutter warranty. A port hole in the 15 litre bin shows when it is nearly full. CPNI & DIPCOG approved. Good clean machine with new cabinet. Paper only shredder with auto oiler. 24 Sheet capacity. 120L bin. 6 month machine warranty. 18 year cutter warranty. CPNI approved. The multi functional 1.9 X 15 Cross cut shredding machine destroys paper, cds, dvds, floppy disks and credit cards. 120L bin. 15 Sheet capacity. It has an integrated Auto Reverse Function for easy removal of overloaded paper. User friendly thanks to i-control® function control. 2x2 cut & collect system has 2 separate cutting blades for digital media dropping into a separate catch basket. Silentec® is an innovative sound dampening concept for quiet operation and EcoLogic delivers real energy efficiency. CPNI and DIPCOG approved. Warranty 2 years on machine. 30 year blade warranty. This High Security shredder destroys paper , staples, paper clips and credit cards. 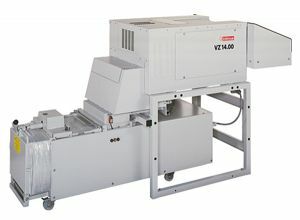 Automatic on/off control via a light barrier whenever paper is introduced into the feed opening• It is controlled manually via the soft-touch membrane keypad when paper is inserted into the feed chute• Automatic reverse in case of paper jam• Optical or audible fault indication• Fully enclosed dust-free mobile base with large capacity integral catch basket• The catch basket can be pulled completely out of the shredder on a sliding frame for easy removal of the shredded material• Mounted on rollers for flexible use. 2 year machine warranty. 3 year cutter warranty.